Different plants need different types of soils. How do you know what soil your specific plant needs? Often times googling it is great, but you can also ask your local garden center when purchasing your plant. Did you know you can test your ground's soil compost to see what type of soil you have? Testing your soil will help guide you when choosing which plants will grow in your yard. Another important thing to remember when gardening is that unhealthy soil will only produce an unhealthy plant. Making sure that your plant get's the best nutrients from its root is essential to your plant's life. 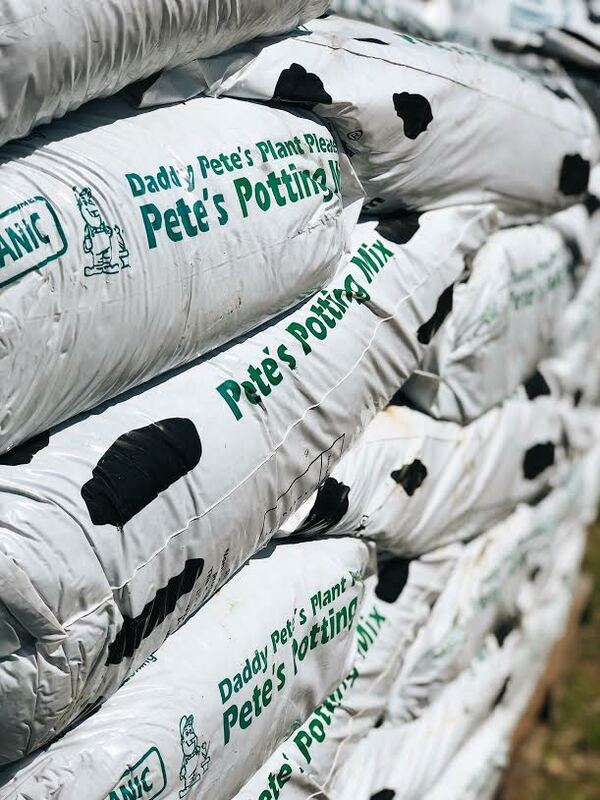 That’s why we love to carry and use Daddy Pete’s Plant Potting Mix at our stores here in Burlington, North Carolina. This soil is organic and makes a great all purpose soil for pretty much anything- pots, beds, shrubs, etc. The soil protects your plants from the elements, and also prevents those pesky weeds from growing. The soil plays a huge role in your plant’s life, so remember to stop by Garden Valley Market to get a good quality soil that will keep your plants happy and healthy all season long! It's very important to check your plant for what zone it is able to grow. This information can usually be found on the tag of the plant. For example, a tropical hibiscus would probably not last very long in a cold climate like Minnesota. Or the beautiful snapdragon, which loves the mid 70s weather, but a hot summer in a hot state might cause them to burn out. If you keep in mind which climate/zone you live in, and make your choices based off of that information, it might save you some heart ache and frustration in the long run. Technically, you don't HAVE to fertilize. However, if you're wanting a hardy harvest or an abundance of healthy flower petals, it is definitely recommended. Fertilizing once every four weeks is usually a good start, but be careful not to over-fertilize, as this can stress the plant out by growing too quickly. Also, there are great natural ways, found at this blog, to fertilize your garden if you're not wanting to use chemical-filled fertilizers. There’s an option for everyone! This is probably the most common mistake and complaint that we receive from customers here at Garden Valley Market. It's important to know what your plant's watering needs are if you're wanting to keep it healthy and happy. Lack of watering is simple to understand. Overwatering a plant can sometimes be difficult to notice, however, until it’s too late. Usually overwatering will produce yellowing, and LIMP leaves. watering and check back again later. Did you know that planting too early or too late can set you up for failure? For example, depending on what zone you are in, you might want to plant your tomatoes in late winter, or early spring, to allow for PLENTY of time for your plant to grow and mature. Also, sometimes a plant needs more time to establish their root before growing. For example, a peony does best when planted in the Fall and will generally grow better than those planted in the Spring. Sometimes we can buy too many plants, and not have enough time to maintain them, or even plant them for that matter. When shopping for a plant, remember to reign in on the excitement, and think of what your garden needs, and start from there. Making lists are a great way to help keep up with this. You can always make another trip, especially to Garden Valley Market where you’re always welcome! Also, remember that when planting, space it out with the mature plant in mind. Give your plants enough space to grow, because a crowded plant can sometimes produce more pests and diseases. Plants also tend to compete for water and nutrients when planted too closely together. Look at the recommended spacing instructions on the tag of the plant, and that will allow you to gauge how much space is needed. But what does "full sun" or "part shade" even mean? You don't have to be perfect to garden. Repeat it to yourself. You don't have to be perfect. The true beauty of gardening is not getting it "right" the first time. It's the growth that takes place in your soul, and in your mind. The knowledge and wisdom that you receive from the plants is sometimes better than succeeding. And remembering that when it doesn't go right, or perfect, we can always try again, and that is what's life-giving about gardening. Because each time you try, you get better, you learn, and then you get to look back and see how much growth has taken place in your garden, and in you.